UPDATED: Thu., Oct. 29, 2015, 5:10 p.m.
Spokane City Hall’s top administrator is denying that she tried to soften the details in a news release about an alleged sexual assault of a Spokane police officer by a police sergeant. Spokane County Sheriff Ozzie Knezovich, whose office is investigating the alleged assault, said there were multiple meetings Monday among police officials about the news release. Knezovich said at one of those meetings someone mentioned that City Administrator Theresa Sanders did not want the words “sexual assault” in the release. Sanders shot back in an interview on KHQ and accused Knezovich of lying. She declined in her interview with KHQ to specify what action she plans to take. Sanders did not respond to multiple interview requests Thursday from The Spokesman-Review. Sanders suggested in her interview with KHQ that Knezovich might have confused her with police spokeswoman Officer Teresa Fuller. Sheriff’s Office spokesman Deputy Mark Gregory said he has discussed the issue with Knezovich and Knezovich is adamant that the person referenced was Sanders. 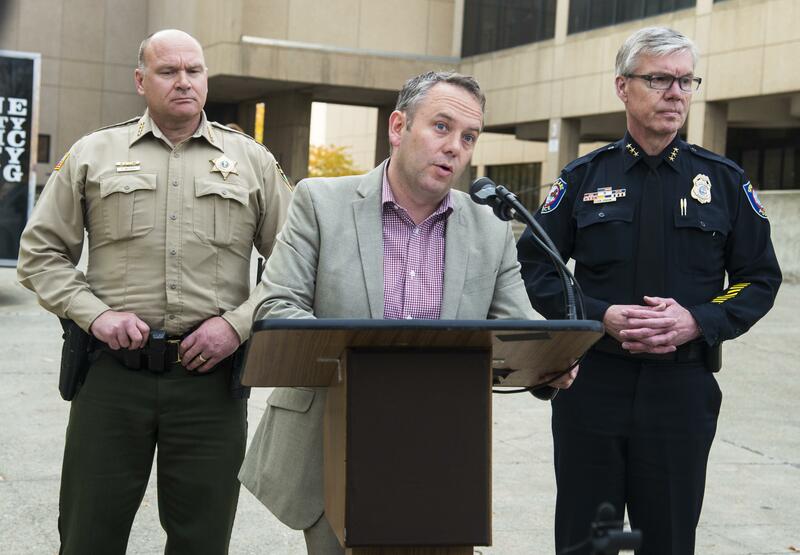 During a press conference Thursday afternoon, Mayor David Condon refused to address the dispute between Knezovich and Sanders but said that City Hall exerted no influence on the news release process. Knezovich said he advised that the release say a police sergeant was accused of sexually assaulting a fellow officer. He pointed out that the details would be publicly known once the search warrant was filed, which happened Tuesday. The alleged assault by patrol Sgt. Gordon Ennis against a female officer occurred at a party hosted by fellow officer Doug Strosahl Saturday night. The woman told investigators that she passed out after having at least four drinks during the evening and that when she awoke in a guest bedroom Ennis had his hand down her pants and was fondling her. Ennis has been placed on paid administrative leave. On Wednesday, Strosahl also was placed on leave after Knezovich announced Strosahl also was under investigation for possible evidence tampering. The woman officer told Strosahl about the alleged assault before she left his home Sunday morning. At the time of the alleged assault she had been wearing borrowed clothes after soaking in a hot tub earlier. She left those clothes behind when she went home. Strosahl later barred sheriff’s office investigators from entering his home to collect evidence without a search warrant. Knezovich said the clothes the woman had been wearing during the alleged assault were washed before investigators arrived with the warrant. Court documents state that both Ennis and Strosahl hired attorneys before they were contacted by investigators. Ennis had been tipped that investigators were working to obtain a search warrant for his cellphone records and a DNA sample, a detective alleged in court documents. Knezovich said that it appears about a half dozen officers were in attendance at the party. “We’re still in the process of rounding up those names,” he said. “I have the utmost confidence in Sheriff Knezovich’s organization,” he said. Published: Oct. 29, 2015, 2:49 p.m. Updated: Oct. 29, 2015, 5:10 p.m.